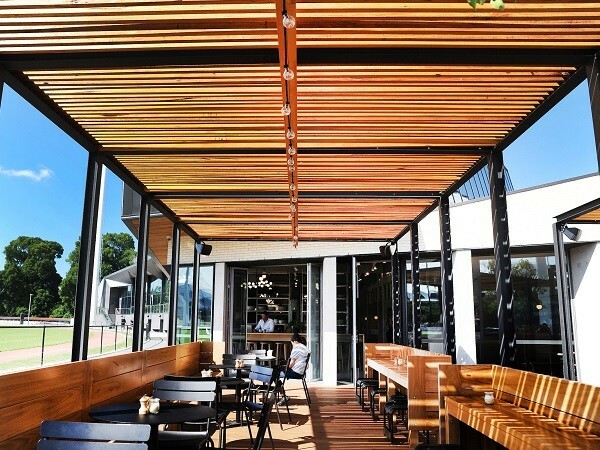 Award-winning construction The Glasshouse located in the heart of Melbourne's Olympic Park precinct, features timber from Britton Timbers in a signature wall panelling as well as in the interior joinery. Overlooking the training ground of the Collingwood Football Club, the new venue has been designed as a sophisticated event space with a cocktail function capacity of 1000, seated dinner capacity of 500, auditorium capacity of 150, and a private boardroom. For their work on this project, ADCO Constructions was announced as the Victorian winner of the Master Builders Award for Excellence in Construction of Commercial Buildings $20-$30 million, and is now a finalist for the national title. Chris Duff, Contracts Administrator at ADCO, said everyone was very pleased with the design outcomes of The Glasshouse project. The building was constructed from a variety of natural materials including zinc, aluminium, steel, concrete and timber, the latter being a significant facet of the project. World-renowned interior design firm Hecker Guthrie Studio was responsible for The Glasshouse's impressive interiors. Interior designer Josh Watt explained that the space was designed for celebrations and events of a high standard; the fit-out, therefore, needed to reflect it. The beautiful vertical wall panelling in profiled American Oak is a signature feature made from timber panels, custom designed by Hecker Guthrie with a scalloped shape. According to Hecker Guthrie, timber was specified because it delivered a high quality finish that added luxury and sophistication to the space. Additionally, timber also gives the space a feeling of warmth and comfort. Britton Timbers was engaged by sub-contractor Mount View Constructions to supply the timber for the wall panels. Nicholas Fitrolakis, Account Manager at Britton Timbers, recalled that the original design was for solid lengths of profiled timber. After assessing the design of the wall panelling, they concluded that it would result in a lot of timber wastage. Due to the large sections of panelling, Mount View Constructions decided to construct the panels onsite instead of prefabricating offsite. This met the design criteria and time restraints of the project and allowed long lengths of timber to be used to eliminate panel joints. Britton Timbers discussed some options with Mount View Constructions, and came up with two solutions that would deliver the design aesthetic, but in a more efficient way. A laminated finger jointed product with a solid timber face made to the precise length met all the design requirements while eliminating the possibility of movement, which can happen in solid timber. This resulted in a more consistent product, removing the issue of bowing over the long lengths used on the larger panels. Hecker Guthrie also specified American Oak for the interior joinery. Nuveau Kitchens, who has been creating high end joinery in commercial projects and luxury homes for 34 years, sourced the timber from Britton Timbers. According to Leo Malvaso, Owner and Director of Nuveau Kitchens, they were aware that Brittons was the largest supplier of American Oak in Australia. Since Brittons was already supplying the timber for the wall linings, Nuveau Kitchens wanted the joinery to match the colour and quality of the panelling, ensuring a consistent aesthetic in the space. It was the first time that Nuveau Kitchens had sourced their timber from Britton Timbers, but following The Glasshouse project, they have been getting all their American Oak from Brittons. The team from Nuveau Kitchens sat down with Nicholas Fitrolakis from Brittons and explained their requirements, the application that the timber would be used for, and their guidelines for quality and grade to match the interior designer’s exacting standards. Malvaso said the timber they received met their exact specifications and could be used without any wastage. Nuveau Kitchens also created the furniture in the outdoor spaces using Blackbutt timber, supplied by Britton Timbers. Blackbutt is ideal for outdoor furniture because it remains stable in harsh weather conditions and is also available at a good price point. The timber supplied by Brittons was clean, free from knots and really good to work with, said Malvaso. Overall, Nuveau Kitchens was thrilled with the result on The Glasshouse. Having installed joinery worth half a million dollars for the project, they didn't have anything that wasn't spot on. ADCO Constructions observed that it was a challenge to coordinate the construction of the project with several contractors. Since all the timbers had to match closely, it was great to have a supplier like Britton Timbers who had the scope to supply to specification.